It's November and planting season. In my region Zone 9, I must wait until the warm weather turns cool before I can do any major transplanting in my garden. My Secret Garden in now ready to plant roses, perennials and evergreen shrubs. 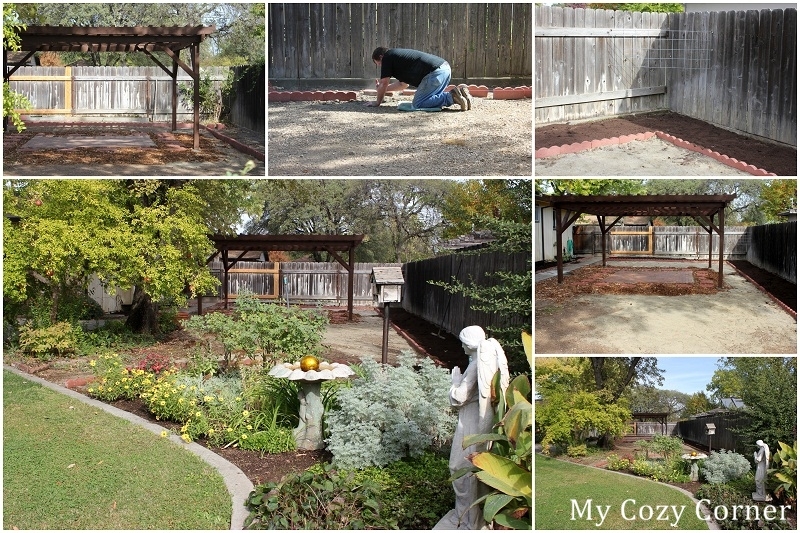 Sweetheart installed a brick scalloped border to the 4 foot flower bed a few weeks ago. I removed the large 'Sally Holmes' rose bush and cleaned up the debris around the area in the corner. Sweetheart is working down the side of the yard. Finishing the border. When he finished placing the border in the trench, he filled the border with sand and packed it down tightly. The metal support is waiting for 'Sally Holmes' #2. Monday and Tuesday of this week Sweetheart and I hauled 2 yards of soil conditioner into the flower bed. He loaded the wheelbarrow and dumped the dirt and I spread the dirt with a rake. I worked slow and didn't hurt myself. I don't go to the Gym,I have a garden. LOL. Now I'm ready to transplant roses and flowers from my established perennial garden. Within the next few weeks I will be planting flowers in their new home in between rain storms. The large maple tree in our the front yard has a ton of leaves that drop each fall and need to be removed from this area before we can spread the remaining red bark ground cover. I looking forward to the color and blooms next spring. I'm so blessed to have a beautiful space to entertain, and set teascapes and tablescapes in 2013. I was so excited to write this post, and share with you an update to the progress of My Secret Garden. I love the way the pergola photographs. My new baby! I will be joining some fun parties. Please come along and have some fun too. Gorgeous! What a great little retreat! This would be a great addition for Fresh-Cut Friday! Your garden is so pretty! Oh boy that's going to be great! Next spring will be awesome! That's a great pergola you installed!